Aviation Updates Philippines - When it comes to flying, there are airlines that get you from point A to point B, and then there are airlines that get you. At Alaska Airlines, and at Virgin America, it’s always been about the latter. 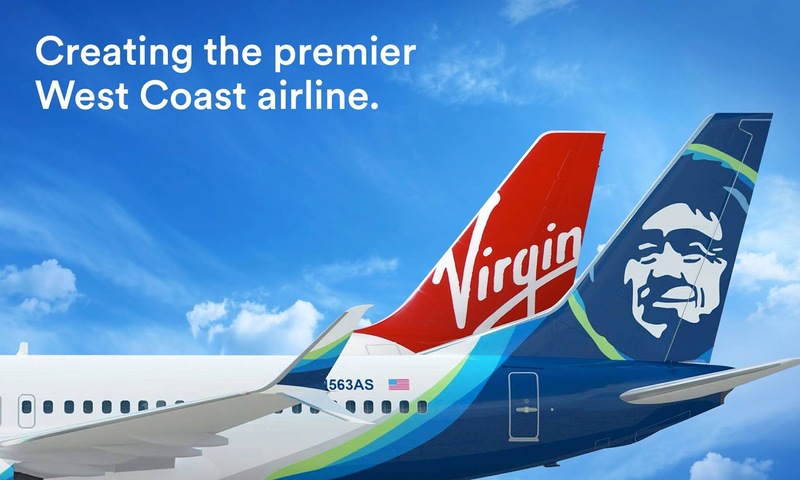 Today two of the country’s favorite carriers announced their intention to merge, forming the premier airline for people on the West Coast to fly. “From our roots in our namesake state to today, we’ve been committed to our customers, our employees and the communities that we serve. Today with the acquisition of Virgin America, our company, and that commitment to both ours and Virgin America’s customers, is only getting stronger,” said Alaska Airlines CEO Brad Tilden. While at first glance the two brands – friendly, Seattle-based Alaska Airlines and the Bay Area’s hip Virgin America – may seem very different, Tilden says they’re more similar than not. “Our company is infused with a pioneering spirit that goes back to our founding in the state of Alaska. Today you can see it in our culture of innovation and the way our employees go above and beyond every day to delight and care for our customers. Those are values that I see mirrored in the culture at Virgin America, and are what will make us better together,” said Tilden. The airline that would become Alaska Airlines was born in the rugged state of Alaska, when Linious “Mac” McGee began carrying passengers from Anchorage to Bristol Bay. In the early years of flying furs and people across south-central Alaska, McGee set the stage for today’s airline. He pioneered the concept of flying a fleet of similar aircraft to keep maintenance and crew costs low: a philosophy that both Alaska Airlines and Virgin America continue to fly by today. That spirit of innovation is alive and well at Alaska Airlines. In 1995, it was the first U.S. airline to sell airplane tickets online. A year later, Alaska Airlines pioneered satellite-based GPS technology to fly more safely and precisely. Today, the airline is testing electronic bag tags – the first U.S. airline to do so – and boasts the industry’s only five-star rated mobile app. Alaska Airlines has spent the last several years enhancing its onboard product, serving Pacific Northwest-inspired food and beverages and installing custom-designed, leather Recaro seats with 110-volt and USB outlets in every seatback. In 2015, Alaska was the first airline to install Boeing’s Space Bins – redesigned overhead compartments with room for 48 percent more bags. So far in 2016, Alaska Airlines debuted its biggest brand update in a quarter century, hired an internationally known fashion designer to design new uniforms for 12,000 customer-facing employees and changed a flight path to accommodate a plane full of “umbraphiles” hoping to see a total solar eclipse. And if 80 years of history is any indication, there’s plenty more to come. Virgin America was founded just nine years ago, and quickly established itself as its own kind of pioneer – one that catered to a tech clientele and conducted itself with a start-up mentality within a 100-year-old industry. While Alaska Airlines was replacing its pilots’ paper flight manuals with iPads, introducing the industry’s first baggage service guarantee, and implementing biometric check in at its Board Room lounges, Virgin America was hosting the first-ever live stream from the air, introducing the world’s first seat-back food and drink ordering system, and debuting “Google Seat View” to offer tours of its aircraft via Google Maps. The new airline will also be one of the industry’s greenest – between Virgin America’s carbon offset program (a first among airlines) and Alaska Airlines’ efforts to propel the development of aviation biofuels, a shared commitment to the planet will be a top priority. The carriers also currently fly two of the youngest fleets in U.S. skies, for better fuel efficiency and limited carbon emissions. Together, they will boast an average fleet age of 8.5 years. With Alaska Airlines’ strong foundation in the Pacific Northwest, and Virgin America’s California hubs, both airlines’ fliers will enjoy a strengthened route network with more than 1,200 daily departures to destinations across North and Central America. Alaska Airlines has received top accolades for its customer service scores for eight years and counting, while Virgin America regularly receives top marks in rankings of best domestic airlines. For the past three years, Alaska Airlines has been ranked No. 1 in the Wall Street Journal’s annual airline scorecard. For the past two, Virgin has ranked No. 2. That commitment manifests in the almost $12 million in charitable contributions Alaska Airlines made in 2015, and the numerous non-profits supported by Virgin America throughout the state of California and nationwide.